Rock and Roll is all about the freedom of expression. 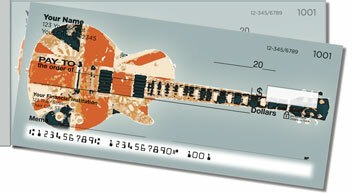 The four ecclectic guitars featured on this check design are no exception. Lots of rock stars have played unique guitars - from Jimmy Page and his double-neck Gibson to the Fender Jimmi Hendrix set on fire. A musican's guitar is quite often a representation of the artist. Who could forget Prince's purple guitar made to look like the symbol that was briefly his actual name? 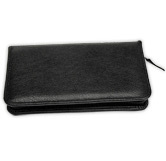 Express your own individuality by putting something different in your checkbook. 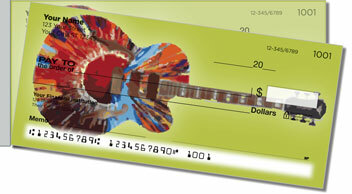 Why go dull and drab when you can use checks that rock? 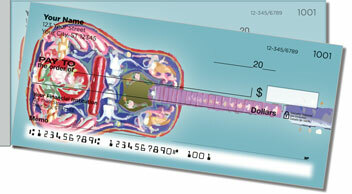 Besides an original look, the handy side-tear format makes your checks easy to remove without ripping or wrinkling! 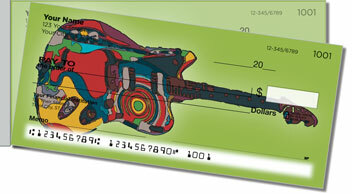 Get your own Psychedelic Guitar Side Tear Checks now! Order them with a set of matching mailing labels to make it complete.